Amino acids are building blocks of proteins, while fatty acids are key components of cell membranes. Both are essential to life, but can also be found in non-life sources. The Chemical Laptop may be able to tell the difference. Like a tricorder from "Star Trek," the Chemical Laptop is a miniaturized on-the-go laboratory, which researchers hope to send one day to another planetary body such as Mars or Europa. It is roughly the size of a regular computing laptop, but much thicker to make room for chemical analysis components inside. But unlike a tricorder, it has to ingest a sample to analyze it. "Our device is a chemical analyzer that can be reprogrammed like a laptop to perform different functions," said Fernanda Mora, a JPL technologist who is developing the instrument with JPL's Peter Willis, the project's principal investigator. It's possible that life on other worlds might use the right-handed kind. "If a test found a 50-50 mixture of left-handed and right-handed amino acids, we could conclude that the sample was probably not of biological origin,"
"But if we were to find an excess of either left or right, that would be the golden ticket. That would be the best evidence so far that life exists on other planets." The battery-powered Chemical Laptop needs a liquid sample to analyze, which is more difficult to obtain on a planetary body such as Mars. The group collaborated with JPL's Luther Beegle to incorporate an "espresso machine" technology, in which the sample is put into a tube with liquid water and heated to above 212 degrees Fahrenheit (100 degrees Celsius). The water then comes out carrying the organic molecules with it. The Sample Analysis at Mars (SAM) instrument suite on NASA's Mars Curiosity rover utilizes a similar principle, but it uses heat without water. Once the water sample is fed into the Chemical Laptop, the device prepares the sample by mixing it with a fluorescent dye, which attaches the dye to the amino acids or fatty acids. The sample then flows into a microchip inside the device, where the amino acids or fatty acids can be separated from one another. At the end of the separation channel is a detection laser. The dye allows researchers see a signal corresponding to the amino acids or fatty acids when they pass the laser. Inside a "separation channel" of the microchip, there are already chemical additives that mix with the sample. Some of these species will only interact with right-handed amino acids, and some will only interact with the left-handed variety. These additives will change the relative amount of time the left and right-handed amino acids are in the separation channel, allowing scientists to determine the "handedness" of amino acids in the sample. Last year the researchers did a field test at JPL's Mars Yard, where they placed the Chemical Laptop on a test rover. 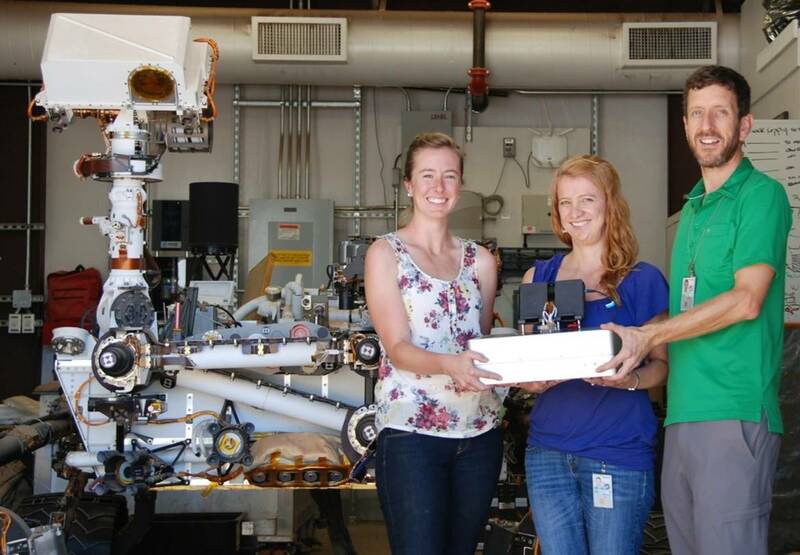 For this test, the laptop analyzed a sample of "green rust," a mineral that absorbs organic molecules in its layers and may be significant in the origin of life, said JPL's Michael Russell, who helped provide the sample. Currently, chemical laptop the instrument can detect concentrations as low as parts per trillion. "This could also be an especially useful tool for icy-worlds targets such as Enceladus and Europa. All you would need to do is melt a little bit of the ice, and you could sample it and analyze it directly,"
The Chemical Laptop technology has applications for Earth, too. It could be used for environmental monitoring -- analyzing samples directly in the field, rather than taking them back to a laboratory. Uses for medicine could include testing whether the contents of drugs are legitimate or counterfeit. JPL researcher Jessica Creamer recently won an award for her work in this area at JPL's Postdoc Research Day Poster Session. NASA's PICASSO program, part of the agency's Science Mission Directorate in Washington, supported this research. The California Institute of Technology in Pasadena manages JPL for NASA.